The meta title tag is missing from your page. A missing or poor title tag (that does not target important keywords or phrases) will make it difficult for your page to rank well in search engines. You can't have more than one <title> element in your page and if you skip this tag, the document will not validate as HTML. The title tag is one of the most important factors when it comes to successful search engine optimization for your page. It is located within the section above the descriptions and keyword tags. The title tag is what is displayed on the search engines result page (SERP) and it provides a summary about your website. Use the most relevant keyword in your title tag and keep the length around 10 to 60 characters. There is no penalty for longer title tags, the end of the tag will simply be ignored by the search engines. The meta description of your page has a length of 30 characters. Most search engines will truncate meta descriptions to 160 characters. Your webpage does not contain any H1 headings. H1 headings help indicate the important topics of your page to search engines. While less important than good meta-titles and descriptions, H1 headings may still help define the topic of your page to search engines. In order to pass this test you must indentify the most important topics from your page and insert those topics between <h1>...</h1> tags. Your webpage doesn't use any HTML compression! You should compress your HTML to reduce your page size and page loading times - this will help your site retain visitors and increase page views. If you were using compression, you could be compressing your HTML size by 77% - from 56.51 Kb to 12.92 Kb . Your website loading time is around 8.29 seconds and is over the average loading speed which is 5 seconds. Your website is not using cache headers for your images. Setting cache headers can help speed up the serving of your webpages for users that regularly visit your site and see the same images. Learn more about how to add expires headers to your images. Your website is not using cache headers for your CSS resources. Setting cache headers can help speed up the serving of your webpages for users that regularly visit your site. http://stairman.ee/fi/etusivu and http://www.stairman.ee/fi/etusivu resolve to the same URL. Your website is not using https, a secure communication protocol. Even for sites that do not collect sensitive customer information, search engines suggest that switching to https is an increasingly good idea and may help improve rankings. We've found 4 email addresses in your page code. We advise you to protect email links in a way that hides them from the spam harvesters. Your webpage is using the canonical link tag. 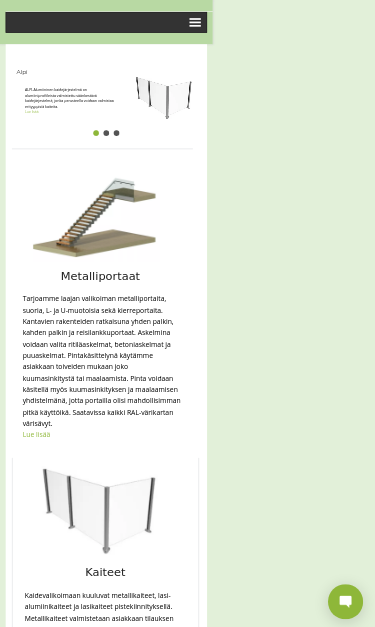 This tag specifies that the URL: http://stairman.ee/fi/etusivu is preferred to be used in search results. Please ensure that this specification is correct, as canonical tags are often hard-coded and may not always reflect the latest changes in a site's URL structure.